Preliminary Article: "Feburary 5, 2018"
also Draining the battery, thus leading the way for More Sulfation. This Circuit helps to Desulfate a Lead Acid battey. These Pulse Spikes also gives a Small amount of a Charge to the battery. 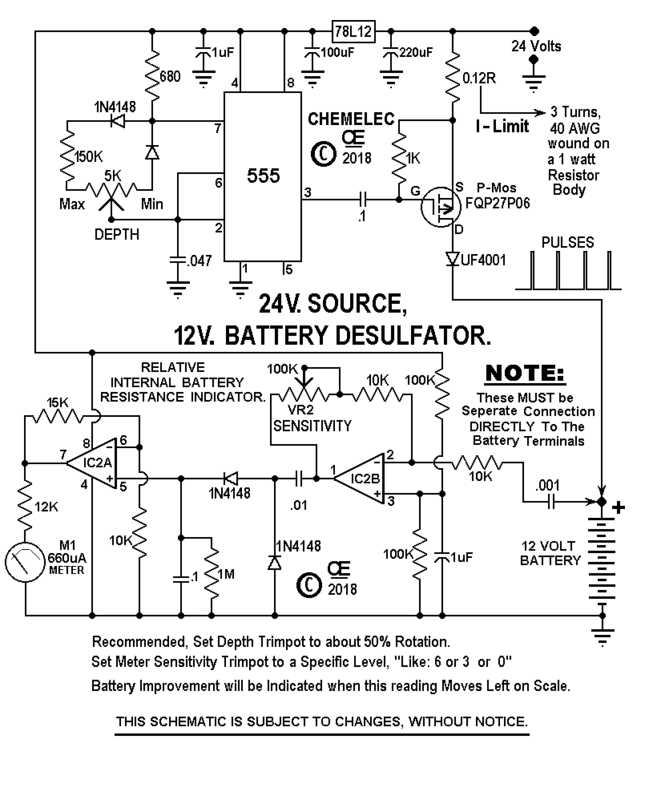 The Additional circuit also gives a RELATIVE Indication of the batteries Internal Resistance. This signal is than amplified and gives a reading on a Micro-Amp Meter. So the "LOWER the meter reading the better". NOTE: Some Batteries can be Improved, Some NOT. Sulfated Plates are only One of Many different battery problems. So it all depends on whats wrong with your battery? Test Each Cell for Specific Gravity with a battery tester. But if the Battery won't hold a charge of 11 Volts or More, Chances are it is NOT GOOD at all. You have a "BAD Battery" and attempting to Desulfate it, WON'T Help. (Or an Under-Charged Battery), All Cells should read Very Equal, but Low readings. All cells will be EQUIL in Specific Gravity and at a charged level. Reduces its ability to drive High Current. 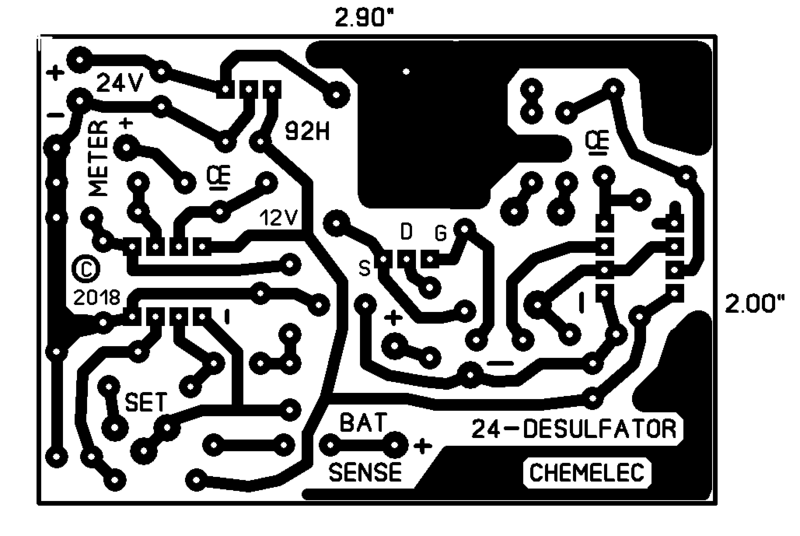 This Circuit will NOT Work for Desulfating a Single 6 Volt Battery. But Two 6 Volt batteries could be Connected in Series. And using one good Battery with the Desulfated battery is Best. In Theory, with "Unlimited Sensitivity", and with a "PERFECT Battery", the meter reading would always read "ZERO". However, This will NEVER HAPPEN on a Real Battery. Meter Readings than Large Car Batteries. This Desulfating Process,  "May take a LONG TIME". and up to "Several Months for a really Bad Sulfated Battery". Normally I recommend the Drive control to be set to a 50% rotation. And than set the Vu Meter to give a 0 Db Reading. Assuming you have a Sulfation Problem, Eventually the Reading should go Lower. you can set the Sensitivity control to give a specific reading. and get a Comparative Test Reading. The Battery with the LOWER Reading, Will be the Better Battery. I have Two 12 Volt 4 A/H Batteries. One is about 12 Years Old and One is Quite New. Starting with the Old One and Setting the Drive Trimmer pot to 50% and the Sensitivity Trimmer so it reads 0 dB. Than transferring the Leads to the Newer one, The reading is down below -10dB. However the Old one is Just Plain OLD, and Not a Sulfation Problem. NOTE: The Range of Adjustment for the Sensitivity Control was "Arbitrary", determined by me. was just a Guess on my part, "Based on tests, using Batteries I presently have". And so far it seem to be a Good Adjustment Range. Starting on Jan 28, 2018, This Circuit is Presently being Tested, by Another Person. And I Will Update this article When I receive some feedback from him. NOTE: On this Prototype, I just use Trimpot controls. However, you can put this board into a suitable box and use a Convential Potentiometers For Better Ease of Adjustment. However I Do Not supply the DC Power Adapter. The Adapter should be rated at 24 Volts and a Minimum of 200mA. Go Back to My "Projects Page"
1)  Connect the Black Wire to the Battery Negative. 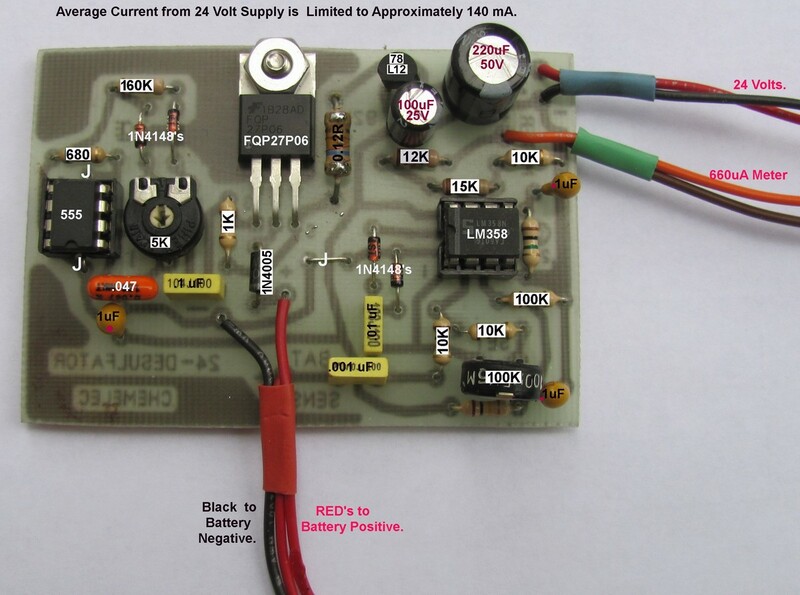 2) Than SEPERATELY, Connect EACH of the Two Red Wires to the Battery Positive. Note: The TINY CUSTOM MADE "0.12 Ohm" Resistor. It is VERY IMPORTANT, NEEDED to create a Current Limit. This Article is "Subject to Modifications"
All Imformation in this Article is "Copyright protected".